Maple Half Vision Display is 48 inches long with a glass display area of 18 inches high by 20 inches deep. Our showcase comes with one adjustable shelf measuring 12 inches long. Store extra merchandise in the rear storage area to reload the shelf quick or other accessories close at hand. 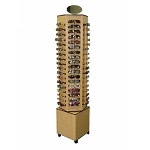 Add the optional lights for this particular retail display case to highlight your merchandise. 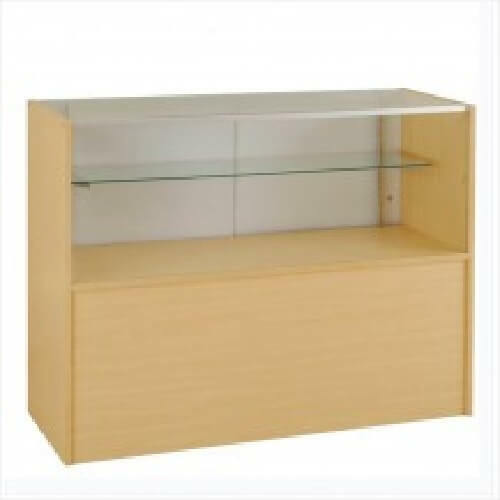 With the maple finish, you are sure to match the other display cases in your business. For other decors, we also offer this case in black finish as well as white finish. It's simple to place your order, just click to add to your shopping cart! Front Viewing Area Measures 18"
Shipping is approximate - We will call to verify shipping costs. Heavy Truck Shipped-Shipping Surcharge Applies.